All transactions are safe and secure with a reliable history in online purchasing behind each of our associates. 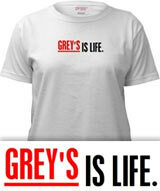 Buy the Grey's is Life t-shirt to own Grey's Anatomy clothing and merchandise. If you spend your spare time listening to your Grey's Anatomy soundtracks, as you imagine yourself caught in the middle of the hospital's love triangles, then this tee is tailored for you. The design on the front reads, "Grey's is Life." It is printed in the style of the familiar Grey's logo, with the word "Grey's" underlined in red. This Grey's Anatomy t-shirt is a fitting gift for any admirer of the TV series. Wear this underneath a comfy Grey's Anatomy sweatshirt hoodie. The design is also available on hats. In addition to the Grey's is Life tee above, browse the Grey's Anatomy Clothing Gallery for more apparel like men's and women's clothes, kids shirts or hoodies.